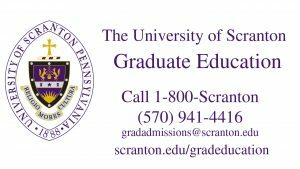 It was commencement weekend and Mitch Clark G’17 and Kelsey Morgan G’17 were set to graduate with degrees from The University of Scranton, but they hadn’t spent years walking up the Commons as so many do. In fact, they had just met. The online graduate students had both just arrived on campus for the very first time. Morgan had just an hour-and-a-half trip from New Jersey, but it might as well have been a journey to an alternate universe. A Catholic with a distinct interest in Jesuit stewardship, Clark said Scranton had “just felt right” for him as a student, but getting to walk around now and “read all the St. Ignatius quotes” really brought his online experience home. Just about five years ago, Clark, 29, of Lincoln Nebraska, and Morgan, 28, of Fredon, New Jersey, walked the traditional grounds of their undergraduate universities, enjoying a traditional experience, sitting in classrooms and interacting in person with peers and faculty. Morgan, who attended Lafayette College in Easton, lived first in a residence hall, then a sorority house, then an apartment, and enjoyed every perk of presence. Clark, who attended the University of Nebraska-Lincoln (UNL), also started out in a dormitory before moving into an apartment and taking advantage of college life. CLICK HERE TO READ THE REST OF THIS STORY FROM THE SCRANTON JOURNAL! Photo caption: Kelsey Morgan with her family on graduation day.